Hi all. It has been a long time between post, and I hope you find this one worth the wait. What’s been going on? Well, our real jobs have kept us occupied. Plans are underway to work on the farmhouse. Right now, we are winterizing so that we can renovate in some comfort. The garden also is being winterized with plans for one more tillage and massive mulching of the non-production zones (one quadrant is still working for us on through the winter). And…we prepare for the holidays. As for today, a frozen, ice crusted and rainy day was spent at the farm. Hours were spent shaking ice off of row covers and adding more ribs for reinforcement. Herbs, celery, and broccoli were harvested. Time was taken to muddle through mud to collect sweet potatoes and some amazing carrots. It is the later item that I want to focus on for the rest of this post. I harvested some of the biggest cowboy carrots yet! 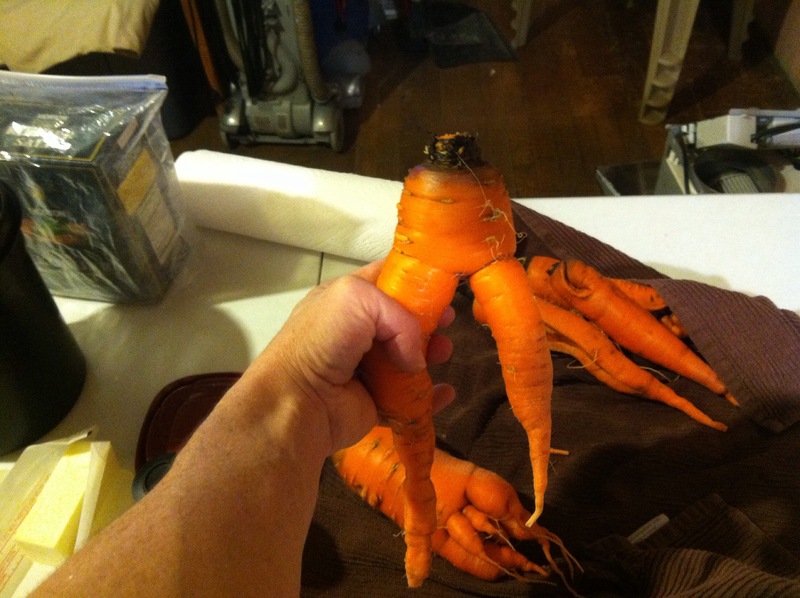 I call these guys cowboy carrots because of the bow legged similarity. Look at the size of this guy! 1. Heat butter in a Dutch oven or large (4-5 quart) pot over medium heat. Add onions, curry powder, salt, and pepper. Cook stirring, occasionally, until onion is soft, about 5 minutes. 2. Add broth, carrots and water; bring to a boil. 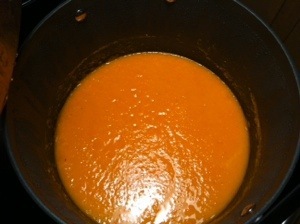 Reduce heat; cover and simmer until carrots are tender, about 20 minutes. 3. Purée soup (recipe called for use of a blender and noted that hot liquids expand and to be careful not to fill the jar more than halfway; allow heat to escape to prevent splattering – do this by removing the cap from the hole in the lid and cover with a dish towel while blending; blend in batches). I used an immersion blender and puréed the soup right in the pot. Add more water to thin to desired consistency. Stir in lemon juice. Serve garnished with cilantro, if desired. The result – beautiful, rich color and amazingly delicious! Field to table to tummy goodness. I served this soup coupled with sweet potato biscuits (a recipe from another blogger Minced; check out her site for that recipe and other tasty things to try).